At Truckee-Tahoe Pet Lodge we believe every pet deserves extra pampering so we’ve created an All-Suites dog boarding facility (and they all feature room service!) here in Truckee, CA. No small chain link cages of an “old school” boarding kennel, just the best accommodations for our guests. The Superior is our basic dog boarding suite. It’s a 4’ x 8’ foot climate-controlled private space of finished steel and glass. Each room comes with a raised Kuranda bed and bedding that’s laundered daily. It’s plenty large enough for a giant breed dog like an Irish Wolfhound or 2 medium sized Aussies or even 3 Boston Terriers. There are even several double Superior Suites that are perfect for multiple dog families that aren’t interested in the additional amenities offered in the upgraded suites. Our Smallville Suites were created for our smaller canine guests that prefer a cozier place to relax when they’re not out playing with other little friends. 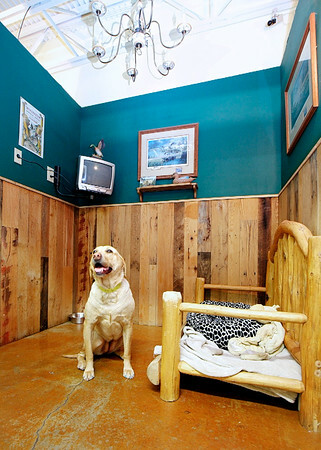 Each suite is a comfortable 3’ x 4’ and includes a Kuranda with bedding that’s laundered daily. The Deluxe is a larger 6’ x 8’ climate controlled room that’s great for multiple larger dogs as well as those that might enjoy a little more privacy-the rooms feature standard doors along with our raised Kuranda beds and laundered daily bedding. The Premier Suites are our top-of-the-line dog boarding offering. The climate controlled rooms are up to 200% larger (the largest is 8’ x 12’) and include comfortable furniture and Kuranda beds with fresh daily bedding that creates a home-like environment. Many of the rooms include flat screen TV’s for dogs that enjoy binge watching canine favorites like Old Yeller and 101 Dalmatians. Our Old Greenwood Paws House is tastefully decorated like the homes of Old Greenwood with wood paneling and big sliding glass doors. A perfect place to pamper your pet while you’re away!